Single-limb cistern barometer, with reduced scale, for local heights up to 1500 m above sea level. The zero level variations in the vessel are taken into consideration in case of changing atmospheric pressure (reduced graduation). Simple handling, for reading only one sight has to be observed. The vernier is adjusted by rack. As No. 11a9, but for local heights up to 4000 m.
Design similar to No. 11a9, but according to its application as calibration instrument with extended measuring range. 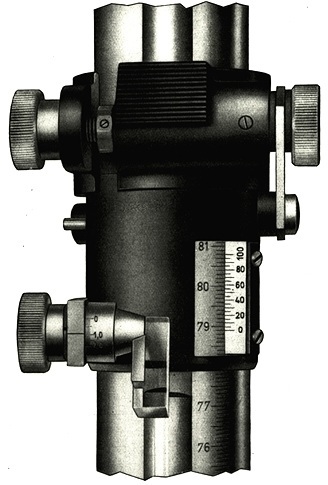 The vernier of the adjusting sight can be adjusted by a worm thread. For frequent calibrations at certain pressure stages short vernier slides can be delivered. Two-limbed cistern barometer with variable cistern volume for elimination of the zero level variations, the degree of the vacuum can be checked by the barometer itself. For this reason it is qualified for testing other barometers. When measuring, the lower mercury column has to be raised to the lower sight adjusted to scale zero, then the rough atmospheric pressure can be read at the upper slide at the graduation by means of the eccentric fine adjustment and vernier. After suitable corrections the true atmospheric pressure is obtained. Each slide is provided with a device to measure the height of the meniscus. Design similar to no. 2k, but according to its application as calibration instrument with extended measuring range. Lower and upper slide are equally equipped: with eccentric fine adjustment, vernier and device for measuring of the meniscus height. By subtraction of both readings the rough atmospheric pressure is obtained and after suitable corrections the true atmospheric pressure is received.